For local friends: come join us for First Monday Classics! The First Monday Classics Book Club meets on the first Monday of the month at 6:30 p.m. to discuss a classic novel. Meetings are held at the main library in Hillsborough. The discussions are facilitated by Piedmont Laureate and local author James Maxey and local author Nathan Kotecki. For May, the group read and discussed Far From the Madding Crowd by Thomas Hardy, and had a lively discussion about the character of Bathsheba. Books are selected by group consensus, so if there’s a classic you’re yearning to read or reread and discuss, please join us! K. Lynn is a personal friend and her new book is wonderful. I’d like to introduce you all to K. Lynn. She and I have been writer buddies for several years now and I am excited to share a tiny spark of her brilliance with you today. She is an awesome critique partner, a wealth of knowledge, and a good friend. Over the last few years, she has patiently nudged me out of my lazy syntactical habits and introduced me to the LGBT genre through her books. K. Lynn has been on a publishing tear lately. His Womanly Ways comes out today and she has a novella coming out in July. (Stay tuned to hear more about that work closer to release day.) K. Lynn joins us today in the storage room to talk about the process she went through when designing the cover for her new novel. One of my favorite stories by R Leanda on Baked Scribe today! A good reminder that you can’t fully know another person’s story from what you see on the surface. Thanks to Dave Higgins for bringing this one to my attention. Yesterday at work a customer made an off hand remark about getting something free. Lots of people do this, nifty percent of the time they are teasing. We laugh, I say sorry can’t do that, and we go on our ways. I was a little offended. First time in a really long time that I’ve ever been offended. I don’t necessarily consider myself a liberal, but I have been on public assistance before. Even now I have free medical from the state because I can’t afford health care. And this is what this person thinks of me? That I just want free hand outs instead of working for myself? Another great post from Sharon Bayliss’s Writer Mama blog tour. Especially if you’re a parent and a writer, you should really check out some of these posts! We love a good Indian meal, but mostly they take too long to cook on a a weeknight. If I cook chicken in the oven at the same time as doing the stovetop stuff, we’ve got this one down to 40 min prep. I am delighted to add Moghalai-Style Chicken to my repertoire! This fantastic curry, which I found in 660 Curries by Raghavan Iyer, is so simple. In fact, I was amazed that it delivered so much flavor for so little effort. It is a mixture of sweet and spicy, and the almonds add just the right amount of crunch. Serving the curry over rice, I found that it makes 5 – 6 servings. You could cut the recipe in half, but I recommend making the whole thing because it reheats beautifully. 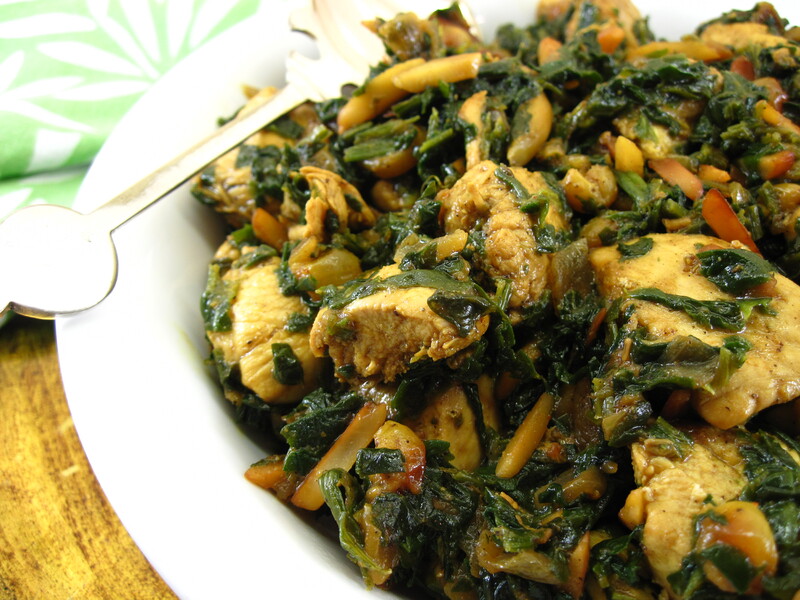 Moghalai-Style Chicken is a quick, easy, and very tasty recipe for this busy holiday season. If you enjoy Indian flavors, I think you will love it!